My plan with this book was to read it right after I read Miss Peregrine’s Home for Peculiar Children by because I was under the impression that it was only a two book series. The prospect of starting and finishing these creepy stories during the Halloween season was just too tempting, and I couldn’t resist. While I really enjoyed Miss Peregrine’s Home for Peculiar Children (click here to read my review) I was less impressed with this sequel. For the most part I really enjoyed it, for many of the same reasons that I loved the first book in this series. The writing is beautiful and lyrical, perfectly suiting the old-fashioned, even elegant feel that this story exudes. The characters, particularly the Peculiar Children, are diverse and have unique backgrounds and personalities. I grew to adore Olive’s cuteness, Enoch’s sass, Bronwyn’s caring selflessness, etc. Again, the general idea for “peculiardom” and time loops is really refreshing to read about because it is so unlike many other YA fantasy novels. I don’t even know if fantasy is the right genre to put it in- it’s more of a blend of historical fiction, supernatural elements, fantasy, and maybe even science fiction. Add in the fact that there are strange, unsettling pictures dispersed throughout the novel, and you’ve got a book that extends beyond the boundaries of conventional genres. I did have a few problems with it, however. The romance Emma and Jacob just didn’t work for me, mainly because it seemed forced and sort of creepy. I mean, this girl was in love with his grandfather- what are the chances that she also falls in love with his grandson? I couldn’t shake the feeling that she likes him simply because he reminds her of his grandfather. And really, is this random girl worth leaving your normal life for? The main problem I had was that I didn’t realize there were going to be more books in the series until I got to the end and there was an advertisement for the upcoming novel that has yet to be released. There certainly is a cliffhanger ending, so I guess the third novel is warranted. But I felt as though the story was beginning to drag out in this book, and I really think that it could have been wrapped up. There are only so many adventures that the Peculiar Children can miraculously survive before the whole process starts to get old. Personally, I would have preferred that this was only a two-book series. 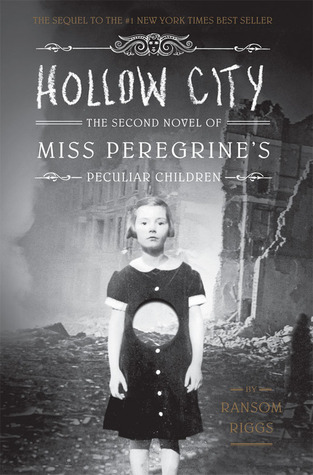 Overall, I did enjoy Hollow City, but not as much as the first one. I’ll probably read the next one in the series when it’s released just to see what happens, but I can’t help but already have mixed feelings about it going in. I know that if Ransom Riggs ever writes anything else, I’ll definitely check it out- his writing is fantastic! Would I recommend it to a friend? : Yes, if they read and liked Miss Peregrine’s Home for Peculiar Children. Have you read either of the books in this series? What did you think? What are your thoughts on there being a third book? Let me know in the comments section below! Next > beautiful blogger award. I felt the same way about this one. I ended up not finishing it, but I still plan to go back to it. I would have rather had a more definitive ending to the first book and just not had a trilogy though!